Hello Friends!! Oh my gosh, it feels so good to be writing again, like sinking into my favorite squishy armchair, at the campus coffeehouse where I have met my friends since college, to sip, gab, bond, and plot to save the world. New phase of life, woo hooooooo! And eekgadds. I have long thought of balance as a dynamic state, like that octopus ride at the amusement park. 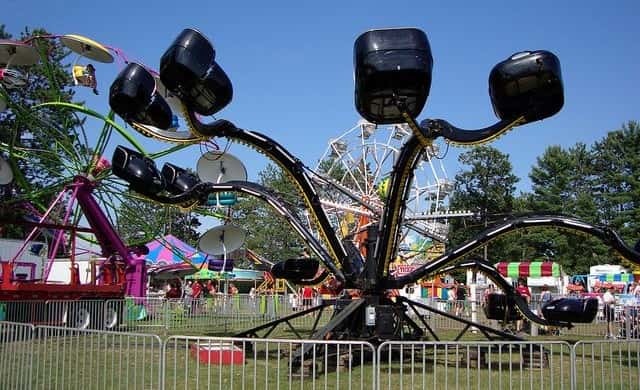 I am the ride, spinning around, raising and lowering each aspect of life in controlled coordination, attending to each car so nobody flies out and gets hurt. With the added responsibility I have taken on at work this year, it feels like I have just agreed to accept a massively overweight rider in that car, and my whole frame now strains to keep everything moving smoothly. At first everything looks normal. But the continuous strain of gravity, mass, and cumulative sheer forces create microfractures in my arms over time. And suddenly one day, something (or everything) may come crashing to the ground. People get hurt. The ride is broken, in need of major repairs, possibly never the same again. Okay so, this is a post I have thought about for weeks and I can finally sit down to write it today/tonight. Since December, two people have told me, essentially, “Medicine has failed at nutrition.” One person was a good friend, the other a new acquaintance. Both were athletes, well-educated professionals, and thoughtful men. I respect both of them and was intrigued by their assertions (and, honestly, just a little defensive). They pointed to the myriad books, fads, products, news articles, and programs around the country in the last decade or so, all claiming to have the one method for lifelong healthy eating. I was taken aback somewhat by both of these conversations, as I don’t feel confused at all about nutrition and eating. I feel personally tempted, frustrated, vacillating, under-motivated, and/or fat, depending on the day. But professionally I feel informed, confident, and reassured that I can counsel my patients solidly toward optimal health. So wherein lies the disconnect? In my practice, our approach to nutrition starts with the patient interview. What is your current eating pattern? How does weekend or travel eating differ from regular workdays? How does this pattern either promote or hinder your health and well-being? What are you doing that’s already healthy and where is there room for improvement? What needs to happen in order for you to make small, sustainable behavior changes for optimal health? How important is it to you to do so? The conversations focus on my patients’ own physical, mental, and emotional experiences around food. They have a chance to relate their eating habits to personal and professional goals, and a vision for their best selves. I have learned that my advice needs to be concrete, specific, and relevant at a granular level. I can roll with Paleo, Atkins, Whole 30, gluten-free, vegetarian, ovo-lacto, oil-less vegan, pescatarian, Mediterranean*, or other diets. There is some good evidence for all of them. But is any one of them the sole antidote to all of our eating poisons? My left brow rises every time I hear someone make this claim. Here’s the key: None of these diets tell us to eat pizza, burgers, chips, cheesy fries, dinner rolls, diet soda, craft beer, loaded nachos, fettucine alfredo, cookies, cake, ice cream, and candy the way most of us do. So what are the underlying origins of my night-time corn chip-cream cheese binges? What strategies can we brainstorm to cut back on my birthday cake consumption between birthdays? Questions like these and the conversations that follow serve my patients far better than my recommending the blood type diet (which I do not). Furthermore, leading proponents of each of these diets also emphasize the importance of concurrent self-care in the other realms of health: Exercise, Sleep, Stress Management, and Relationships. Diet and nutrition are vitally important for health, but they do not occur in a vacuum. All of our health behaviors need to be assessed in their combined context, and recommendations are best made with circumstances, preferences, logistics, and access in mind. If you’re an elite athlete whose diet is already 99% cleaner than the rest of us, yes, maybe there is a subtle difference between medical diets that will affect your performance and sports longevity. Then again, maybe not. And you are also likely attending to your needs for training, rest, recovery, and stress management. So you’re probably good either way. For us regular people, the only diet that works is the one we can stick to, that doesn’t cost us inordinate amounts of psychic energy to maintain, and that actually makes us healthier. How can we tell we’re healthier? We may feel: lighter on our feet, increased energy, more regular bowel movements, clearer skin. When we see our doctors (as we all should, ahem) they may find we have lower blood pressure, lower body fat, smaller waist circumference, lower fasting and overall glucose, lower LDL and triglycerides, and an overall brighter aura and vibe. So maybe keep Michael Pollan’s words in mind as a general guideline: “Eat food. Not too much. Mostly plants.” I would add: Eat foods as close to how they occur in nature as possible. If you can tell what leaf/seed/grain it is by looking at it, it’s probably better than if you cannot. Harvest/kill it, cook it (or not), eat it. The fewer steps the better. Eat often and slowly with people you love. Help each other moderate the junk. Enjoy your food. Life is short. Strive for an eating life that adds joy and delight to your whole being, both immediately and in the long term. *I have no financial, philosophical, or other interests in any of these or other diet programs, products, centers, providers, etc. This entry was posted in Health, medicine, nutrition, personal growth, physician, Uncategorized and tagged diet, food, health, medicine, nutrition, physician by Catherine Cheng, MD. Bookmark the permalink. Good to read your words again, Cathy! It would seem, like so many things, that the simple solution holds more promise than those fraught with complexity. Thanks, Donna! It’s so good to write again! I’m really hoping that I can include blogging again regularly in this new octopus-life ride balance… It really makes me happy to connect to people here… Have a great week!